This release by “Doctuh” Michael Woods has been out for some time, but has recently come to this reviewer’s attention. Woods is the director of Jazz Studies at Hamilton College in Clinton New York, and is a versatile and highly credentialed composer, holding a B.M. in Composition from Akron University, two master’s degrees from Indiana University, and a doctorate in music composition from the University of Oklahoma. He has written everything from symphonic works to compositions for small jazz ensembles. 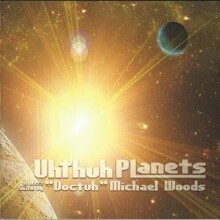 Woods describes Uhthuh Planets as “a treatise on ‘Funk,’” despite few explicit references to the popular music genre by that name in the music included on this album, which is more reminiscent of the contemporary jazz suite that the album’s subtitle (“A Jazz Suite”) references. Uhthuh Planets features excellent musicianship, with Woods and his sidemen playing the album’s arrangements sensitively (listen to Tom Witkowski’s interpretation of “Piano I.Q.,” a piece that is supposed to sound like an alien interpretation of Art Tatum) and taking some strong solos, (hear Wood’s electric bass solo on “I Need Options” and guitarist Tom Bronzetti’s lyrical improvisation on “Enoch”). The record does include some of the programmatic iconography that interstellar groups like Parliament Funkadelic have utilized in liner notes detailing outer space scenes, but the strange sonic textures that would characterize more ‘far out’ musicians like Sun Ra that many may expect as self-conscious sonic references to other interstellar genres are largely absent from this suite. While the music on Uhthuh Planets pulls more from standard contemporary jazz composing and arranging than some of the weirdness that the album’s artwork and programmatic notes may suggest, this album is a well-composed and played jazz suite, and is definitely worth a few listens for those eager to hear extended compositions and compelling improvisations. This entry was posted in Jazz and tagged "Doctuh" Michael Woods, Uhthuh Planets by aaamc. Bookmark the permalink.